Updated Jan. 24, 4:44 p.m. | Posted Jan. 22, 5:58 p.m.
A key vote on a Minneapolis riverfront development plan has been delayed over concerns about the financial health of one of the development's partners. But critics of the Upper Harbor Terminal proposal took little solace in the two-week reprieve — even with promises of more input on the plan's details. The City Council's Economic Development and Regulatory Services Committee was expected on Tuesday to approve the plan, which envisions an outdoor amphitheater, residential housing, offices and a hotel on about 48 acres of city-owned land between the Lowry Avenue and Camden bridges in north Minneapolis. In deciding to postpone the vote, the committee cited reports that its partner Thor Construction has been sued by Sunrise Banks for not making good on its loan repayments. Council member Phillipe Cunningham, whose ward includes the terminal site, said the delay was to make time for city staff to determine the best way forward. "That is to give enough space for city staff to be able to figure out what's going on between Thor and its creditors, what our best options are, and what's the best way to move forward," he said. During the meeting on Tuesday, Cunningham also moved to establish a community advisory committee for the project. "So what this committee is meant to do is to put mechanisms in place to make sure that the folks who are actually impacted are the ones who are making the decision," Cunningham said. "We have recommendations in the concept plan, but all of that is going to be flexible." 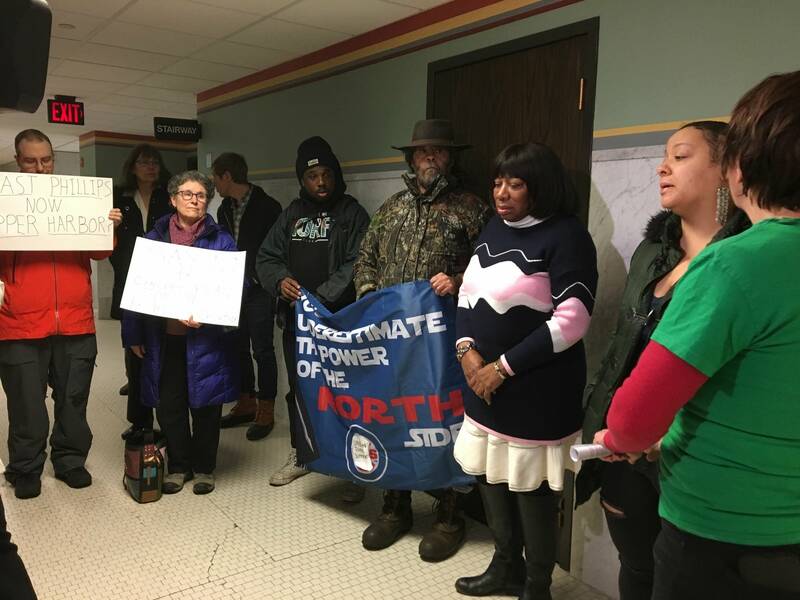 Michael Chaney, a north Minneapolis activist, said the people closest and most directly affected by the Upper Harbor Terminal redevelopment don't even know about the plan. "And when we went to them, asking the two-block radius up there, 'have you heard about the Upper plan?' People haven't heard it. They don't know what it is," he said. "'Has anybody from the city, or any other organizations, Park Board or anybody come to your homes and talk to you?' No, they have not." Chaney is part of the Eco Harbor Co-Creation Team, a community coalition lobbying for decision-making power and a more active role in developing the concept plan. City of Minneapolis officials say they took several approaches to get community input on the project, including door knocking in the McKinley neighborhood, mailing notices to the nearest neighbors and posting online surveys. "The project team held and attended over 80 events, sent out dozens of updates and meeting notices to two large distribution lists," Erik Hanson, the city's director of economic policy and development, said in a statement. The postponement of the vote seemed to fulfill the coalition's demands to delay the process, but members aren't calling it a victory. Whitney Clark, executive director of the Friends of the Mississippi River, said the plan must be changed, not delayed. "They're not questioning whether they want to approve the plan, they're just delaying it," he said. Clark said that a lot of decisions will be locked down if the vote passes. "I don't think [the council members] fully understand how much the approval of this plan essentially decides most of the important questions about this site," he said. Chaney also expressed skepticism about the decision to form an advisory committee, saying critical community members "probably won't be invited." "So in essence what they've done is they've silenced us today," Chaney said. Editor's note: This story has been updated to include information from the city of Minneapolis on its community outreach efforts around the project.